My quick trip to Baltimore was WONDERFUL, except for that I caught a cold while I was up there. My guess is that I caught it on my flight to Baltimore and it didn't catch up with me until Sunday night. After Ian picked me up from the airport Sunday evening, I knew darn well that I didn't feel well and that I'd be getting sick soon. I wasn't able to sleep much Sunday night because I was congested and my entire body ached. I actually woke up at 2:30am and couldn't fall back to sleep until almost 4:00am! Like an idiot, I went into work Monday morning despite feeling under the weather because I don't like missing work. By the end of the day, I was exhausted and mad at myself for going to work. Many people told me to take it easy and to stay home Monday to rest, but obviously I was too stubborn to take their advice. I did take their advice on Tuesday because I stayed home today in order to rest and flush this cold out of my system. Today looks like it will be a couch and hot tea day. I had such a great time in Baltimore, although the flights to and from weren't very enjoyable. It's difficult to get comfortable on a plane, let alone when you're 32 weeks pregnant. It's not as if the flights are very long in duration, I mean, it's only 2.5 hours, but I was uncomfortable for the entire 2.5 hours. I rented a few movies from iTunes before boarding the plane so I was able to occupy myself for the majority of each flight. While in Baltimore, I was able to spend time with friends and family and eat at all my usual places. My mom and I went to Pizza Johns on Saturday night after the baby shower and I don't think pizza had ever tasted so good! I was able to meet my friend Chelsea for breakfast at the Towson Diner and I forgot how much I miss having a diner nearby. 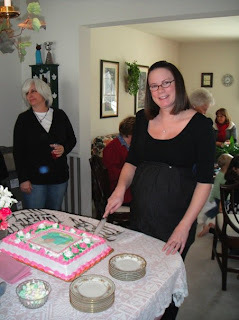 My four aunts on my dad's side of the family hosted a wonderful baby shower for me on Saturday afternoon. My family and friends were all there and it was just a really great time. My grandmother, who had been in the hospital earlier in the week was even able to attend... what a trooper! She will be a great-grandmother before she knows it! My great-aunt Celie was even at the shower and it's so humbling to think that she will be my child's great-great-aunt! My aunts did such a great job hosting the shower and I am so blessed to have such loving friends and family. Pictures have been uploaded to Facebook, as I am too lazy to figure out how to post pictures on this blog. Ian hasn't been sick as a dog, but he sure has been working like a dog! He worked both Saturday and Sunday and will be out of town most of this week. Luckily his trips are only day trips and he'll be home each night. Thank goodness his company owns a private jet! I can't wait for busy season to be over and I know he can't wait either! Like I've mentioned before, he works hard for his pay check and I'm very thankful for those pay checks!I made him crab cakes and MD crab soup last night for dinner. He seemed to enjoy it and we have left overs for this week. Well, I suppose I'd better get back to the couch and make myself another cup of tea. I'm going to beat this darn cold one way or another... wish me luck!